Any visitor is a special treat to a group of kindergarten students. But these kids don’t have any old visitor today. “Ms. Maria! Ms. Maria!,” they chirp in glee as Maria Ruiz, Youth Development Facilitator enters their classroom at Lew Wallace #107. She sits on the floor, in the circle that all their activities take place in, and waits patiently as they take their seats around the circular rug. Without saying a word Maria pulls out a singing bowl and taps the side of it causing a ring to emanate across the classroom. Immediately the wiggles and giggles cease and each student begins taking deep, calming peace breaths. After three of these breaths, where you can literally feel the room’s energy mellow, she begins an empowerment chant that the kids clearly know by heart as they join in. It’s been a few weeks since Maria has seen this class; this is their first week back from fall break. She pulls out a stuffed animal, a black poodle with red bows in its hair. This is their speaking piece. When anyone in the circle wants to speak they have to have the speaking piece in their hands and everyone wants a chance to talk. Maria asks the class if they can remember the book they read last time she visited. She reminds them it was about a not-so-mindful monkey and a very mindful panda bear. She tests them. “YES!,” they say, nodding their heads excitedly. 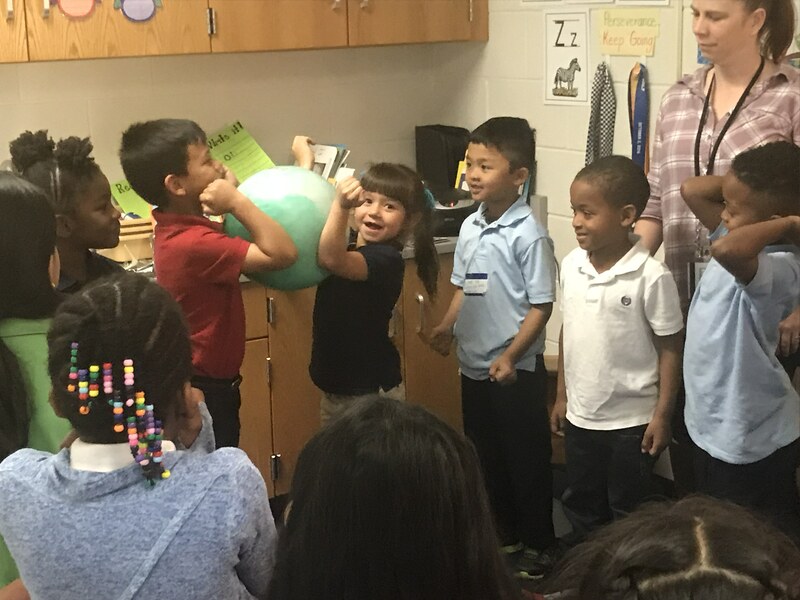 Today’s subject is something different though, and it hasn’t gotten past these astute kindergartners that Maria came with a big green ball today. But before she lets them know what they’ll be doing with the ball she wants to talk to them about what teamwork is. “Does a team work together?” Yes, they decide. “Does a team cheer others on?” Yes, that’s also true. “Does a team leave people out?” No, team’s don’t do that. The rest of the kids clap to show him they agree. And then the moment they’ve all been waiting for. Maria says, “I can talk about teamwork all day long but I want to practice!” She tells the class that their job is to get her ball around the circle as a team, but that they won’t be using their hands or their feet. No, instead this team will be using their elbows to pass the ball! The challenge begins and there’s a lot of giggling and excitement as the ball makes its way around the circle. Then suddenly the ball is on the ground, someone couldn’t quite grip with their elbows. The teachers join in for the second round of the game and it’s clear these kids find great joy in knowing they’re on a team, working together with their teachers. The game ends and the group is having a conversation about all the things that teams do that they did when they played the game when a boy enters the classroom from a bathroom break. He missed the game and the disappointment is written across his face. Maria promptly rises and asks the group, “Is Marcus a part of our team?” YES! And so a third round of pass the ball it is. Too soon for any kindergartner having fun, Maria’s time is up and she is closing the circle in the same way she opened it. The singing bowl chimes three times as you can hear the deep breaths of the little bodies in the room. A bell chimes and I stand in the hallway taking my very own peace breath, knowing I’m leaving a school with a few more kids armed with Social-Emotional skills they didn’t have before. Thank you, Maria, for sharing your peace, love and light with us.